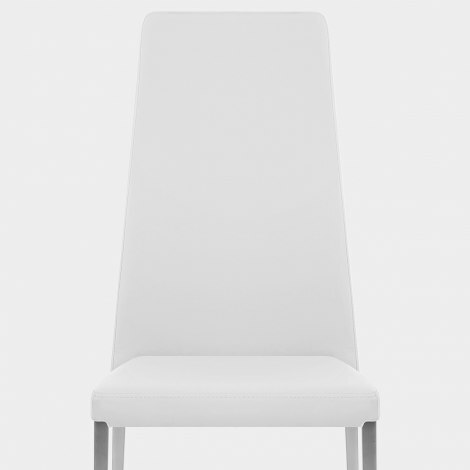 Beautifully simple, the Faith Brushed Chair White Faux Leather can be used in a whole host of locations, its minimalist style the ideal accompaniment to traditional and more contemporary interiors alike. Stackable for practical and easy storage, the Faith offers style as well as substance. Plush white faux leather lends this model a crisp, clean look, enhanced by the simple forms of the tall backrest and square shaped cushioned seat pad. Gracefully tapered, the stainless steel legs are hand-brushed for a muted finish, and feature protective plugs designed to help to prevent damage to your floors. "Our kitchen has been considerably enhanced by this set"
Lovely chairs, really pleased with them, comfortable & stack well. This the first time that I have used Atlantic Shopping. I came across them while googling the type of product I wanted and was spoiled for choice with their amazing range.After selecting what I wanted I placed the order and within 48h hours the chairs were delivered. They were packed securely to avoid any damage and I was very pleased with them. For style, quality and very reasonable price Atlantic cannot be beaten. Very pleased with my dining chairs, great quality and great value for money. Comfortable dining chair which looks good! Arrived ready assembled and well packaged and protected. We ordered cream and although slightly darker than expected, they look really good and are so comfortable. They seem sturdy and the fact that they can be wiped clean will keep them looking good for far longer than a fabric chair. Overall, we are delighted with them. Appreciate the speedy delivery and the fact that we didn't have to assemble them was even better! Very happy, thank you! We are very pleased with the chairs which complement the table we ordered from elsewhere perfectly. The combination has been admired by all our visiors since they have been received. Our kitchen has been considerably enhanced by this set.